If there’s a radio program on Monday noon that you need to listen to while you have to deal with your job or other obligations, it’s likely you’ll have to scour the website’s archives. In fact, you shouldn’t take many efforts to search it – just schedule recording. Free Sound Recorder has the ability of recording online stations at certain date and time or regular time on certain days of week as long as you indicate the time to start/stop the recording. Launch Free Sound Recorder and click “Schedule”. Check “Enable Schedule Recording”. You can select the schedule to be involved with Once, Daily or Weekly. 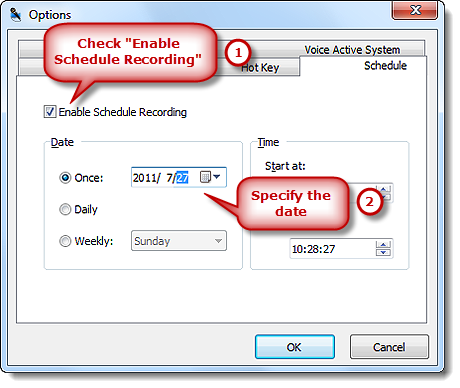 Once – with this option the scheduled recording will be performed only once at the selected date and time for the specified duration. 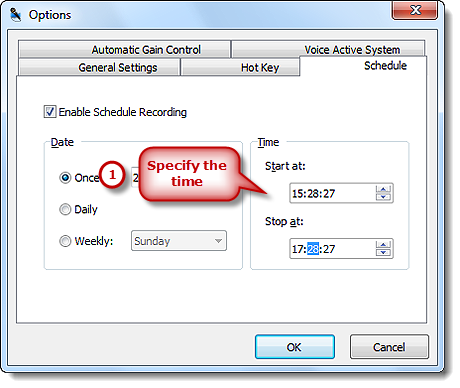 Daily – with this option the scheduled recording will be performed daily at the selected time and for the specified duration, starting from the date specified by Start Date to the date specified by Expire Date. Weekly – with this option the scheduled recording will be performed weekly at the selected days from Monday to Sunday. In “Time” section, you can specify the starting time & ending time that is precise to seconds by entering the number or clicking the Up/Down arrow. Then, click “OK” to save all your settings of schedule recording.